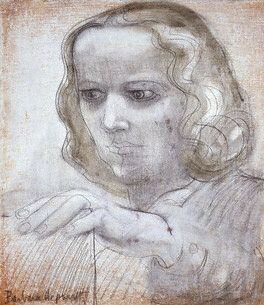 Barbara Hepworth’s work is particularly close to my heart. It was while playing the violin in the garden of her Trewyn Studio in St Ives, that I started to get a clearer idea of how my own life as a musician and as an artist might make sense. This advanced a process which had begun when Eve Molesworth had walked me up to Donatello’s last work, the pulpits of S. Lorenzo in Florence, and ordered me to desribe them to her. There seemed to be a balance between Eve’s perception, that I could never be a full musician until I had incorporated my ‘seeing’ side, and Hepworth’s effortless incorporation of implicitly musical processes into her sculptures. So I sat with a violin in her conservatory, in her workshop, and something seeped through. But, for me, it is in the scraps of conversation with Rainier that we have on record that I see the partnership, the interchange, which I recognise and aspire to.